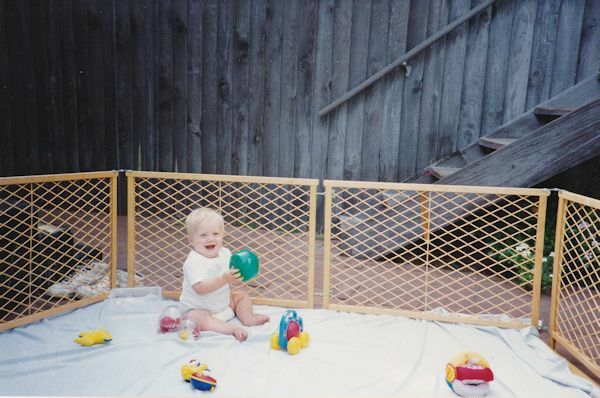 Me: We used the same wooden kiddy corral for all three of our children as babies. 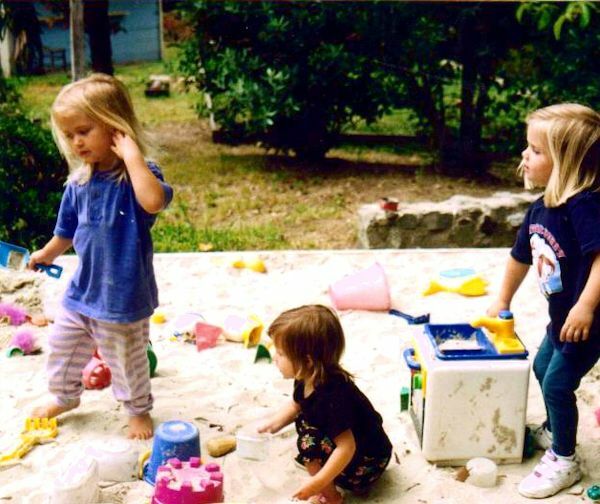 When we had our oldest, we lived in a small house, and our only outdoor space was a brick patio. 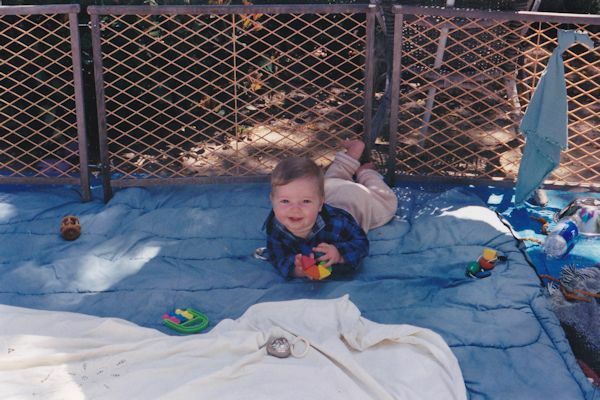 I had a piece of foam cut to fit the dimensions of the kiddy corral and covered it with large sheets and blankets. I shifted it during the day to keep it mostly shaded. We had a table and chairs next to it where I spent many blissful hours watching my daughter play from the time she was three months to one year old. 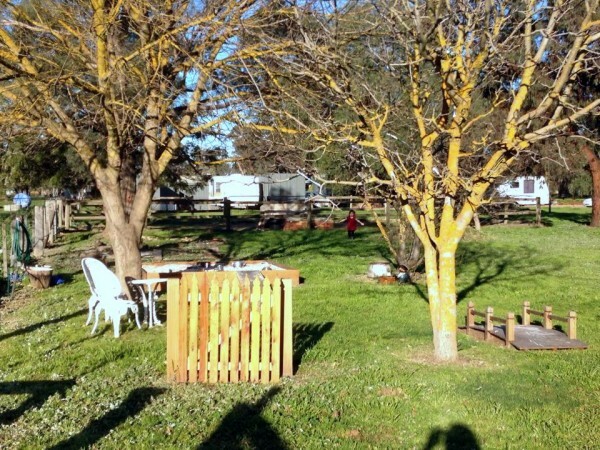 Here’s how we used the corral over the years in a larger outdoor space with our two other babies. Eventually, we purchased a second corral, joined them, and were able to double the space. The kiddy corral had stakes that you could sink into the ground to hold it steady, and we sometimes used umbrellas to keep it shaded. There’s a tarp underneath the blankets. 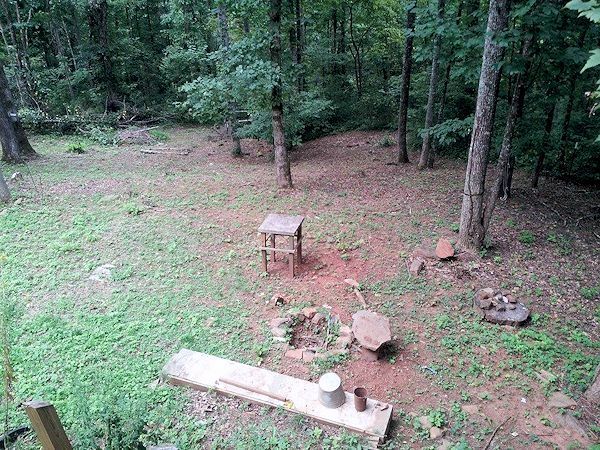 Rebecca: (whose extraordinary backyard could be a post all its own! ): There’s nothing ‘precious’ in the backyard, and it is very much a “yes” space. I thought about adding more plants and a veggie garden or something, but let’s face it — I am a mum of three, so the plants would be lucky to survive. 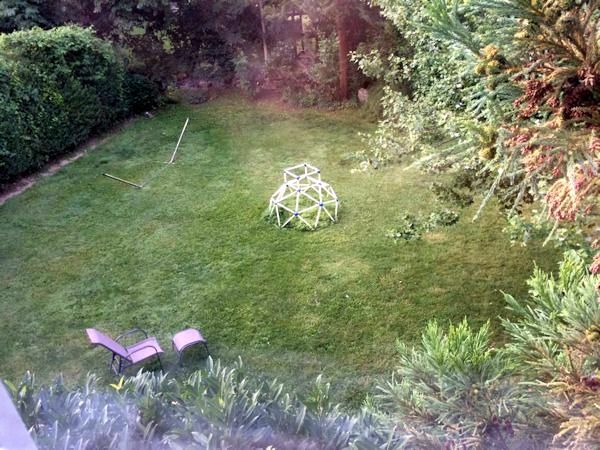 Not to mention, the backyard then becomes a “be careful don’t trample the plants” space. I like that they can dig anywhere they like, transport the sand and dirt, and be rough and tumble without worrying about anything. My children are 39 months, 20 months, and 12 weeks. 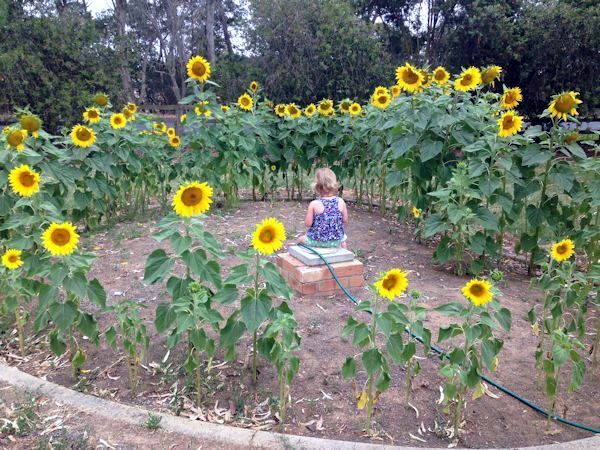 Here’s the sunflower house, which is actually in the front yard so I don’t? have to worry about them running over the plants. There’s a lovely book called Sunflower House by Eve Bunting that the kids adore, especially when their house is in bloom. We’ll replant thicker and earlier in the season this year. 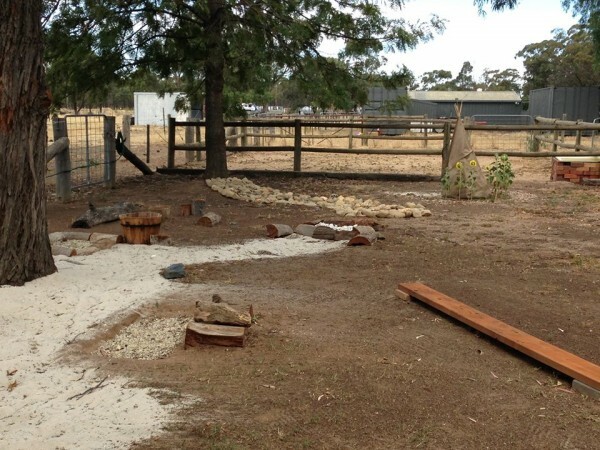 Gravel and rock pit next to the sandpit at the beginning of the sand path. I just took pieces of wood from the wood shed (our winter stash). 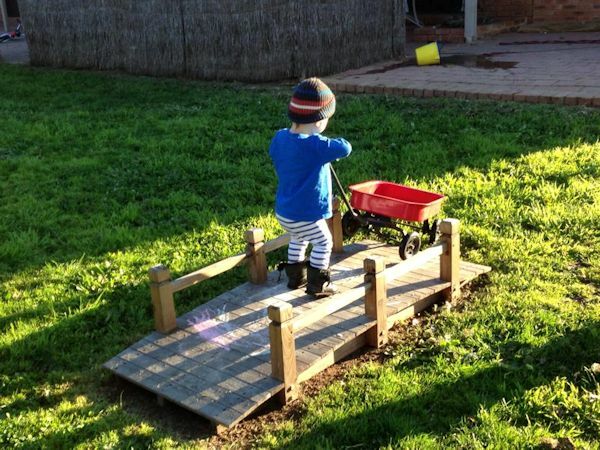 My son was crawling last summer and I wanted him to be able to get in the sandpit on his own, so we bought a ramp. They still use it, often just running up and down it and using it to wheel their wheelbarrows into the pit. 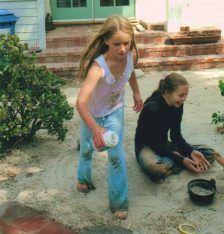 Here’s the sand path, which was just a result of having left over sand from the sandpit. t was all just found materials or very inexpensive from the garden shop. It’s not Pinterest perfect, but that’s why I shared it…so others can see it’s easy to create. 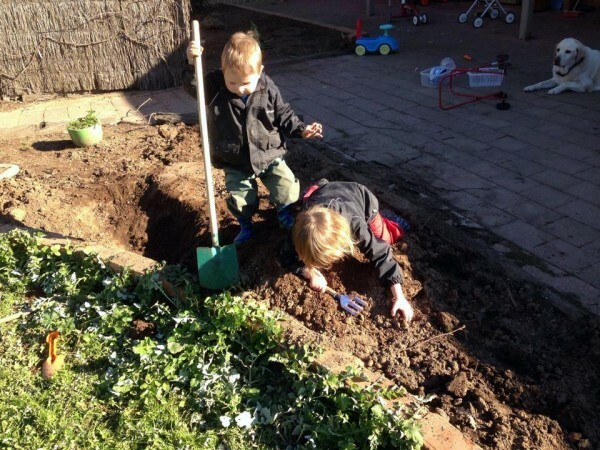 Our kids really enjoy it, and I love that they love such simple, natural play. We’ve since added a gate going no where, and they play with this all the time! 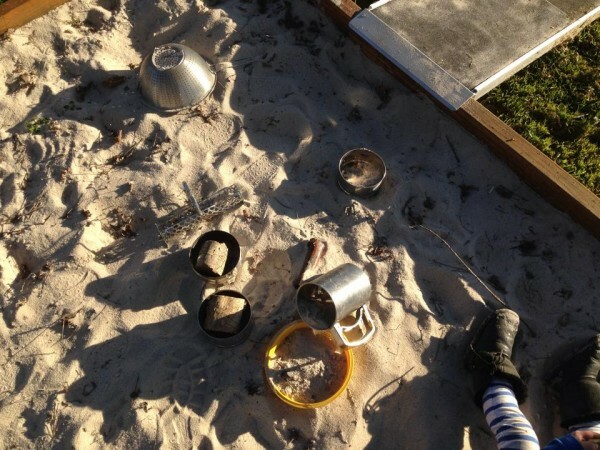 We did a spring clean of the kitchen and just put all the bits in the sandpit. They really like the flour sifter with the sand. The bridge gets tons of use. My son spent a few minutes trying to get his wagon ‘unstuck.’ He used to crawl over it, now jumps off the end, pulls his wagon over it, pushed his wheelbarrow and rides his bike over it. My daughter does the same. The best, MUST outdoor item in our household for winter (it’s winter here at the moment) are Muddlarks!!! Waterproof clothing so we can get out and play in the rain, puddles and mud no matter the weather. All the grass, which is mostly weeds, dies off in summer but now, in winter, it changes the feel. 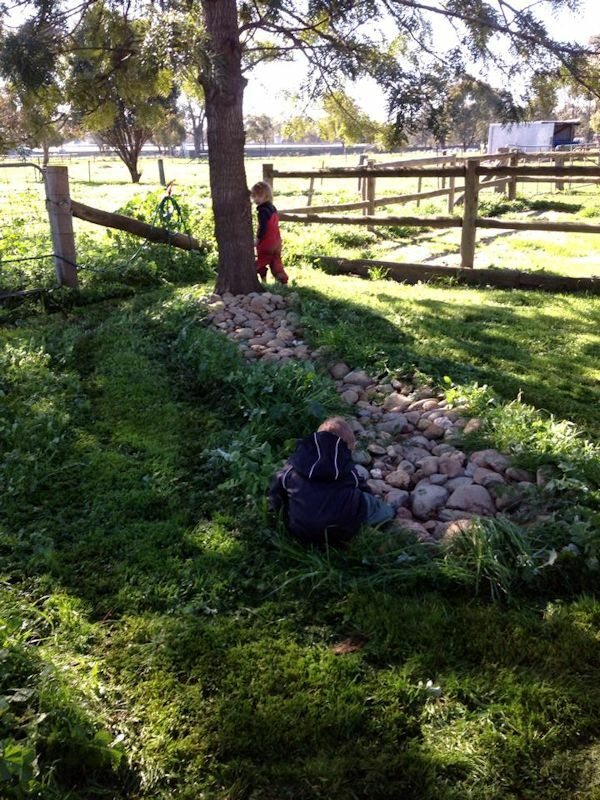 The kiddos weren’t that interested in the dry creek bed in summer but love it now in winter. We had this set up about this time last year. It was off the door to the back yard. My son was 11 months and my daughter was almost 2 1/2. 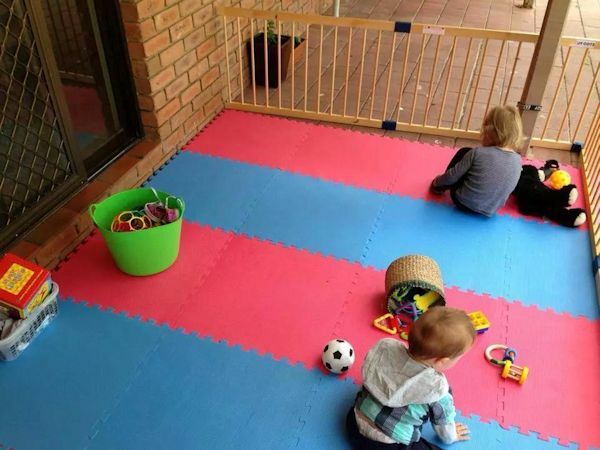 It was great having this space to allow them to go outside without having to watch them the entire time. 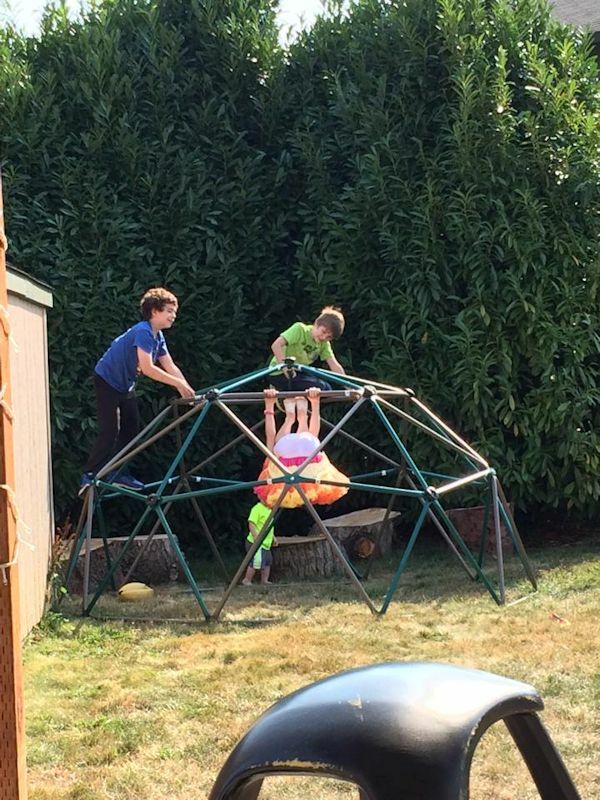 Michelle: We have nothing but this geodesic dome climbing structure. Recyclable plastic. (You can see our hammock frame.) 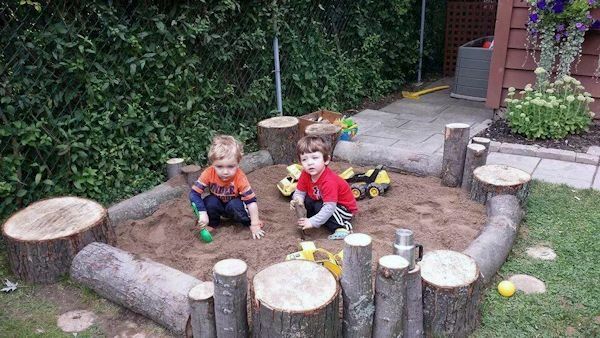 We also have a Step2 sandbox and a garden with junior gardener’s tools. Amy: We just cut down a huge silver maple last week and used the stumps and branches to create this. 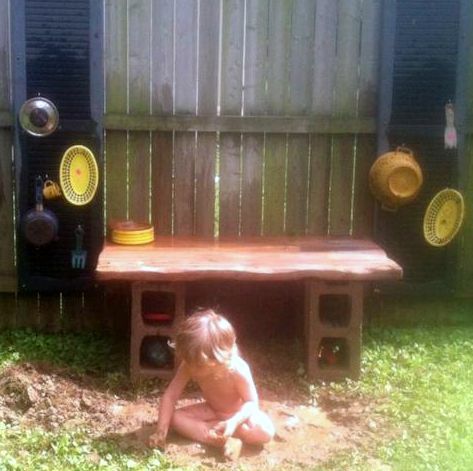 It’s still a work in progress … I’m collecting old kitchen items for it and want to hang some stuff on the fence, but my boys love hopping from stump to stump and using them in their play. 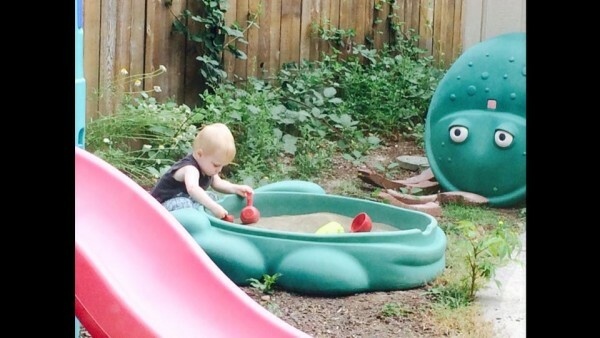 And it’s nicer to look at than a bright plastic turtle sandbox, imo. Fyi, don’t buy builders sand…we got it by accident, and the boys keep coming out looking like they have a crappy spray tan! Everything is orange, ah! 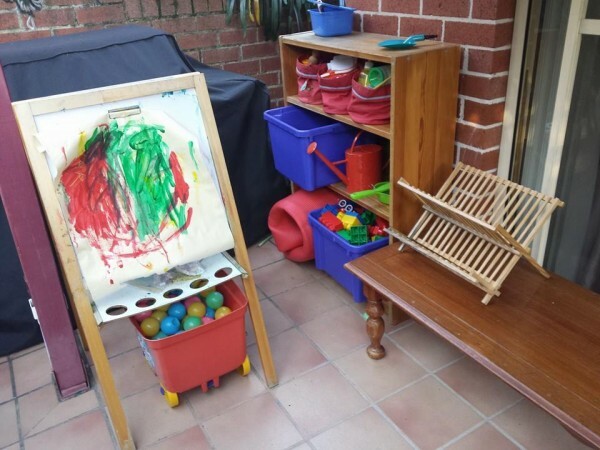 Katijah: Here’s our outdoor space. Sydney: Not pretty, but functional! 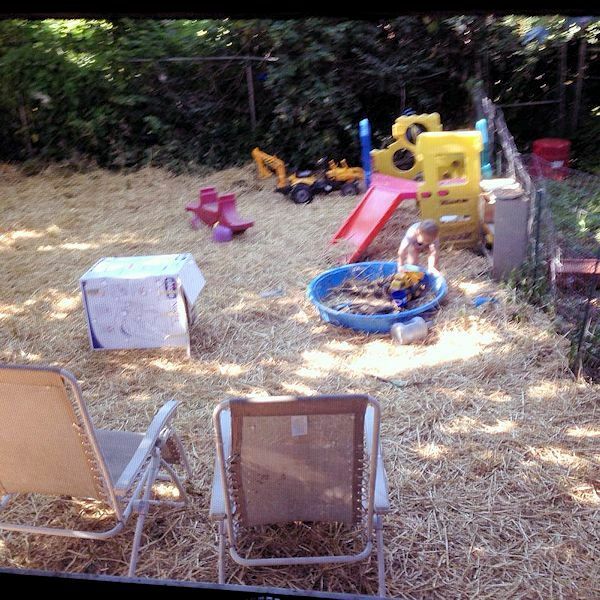 So, details: that’s sand in that blue pool (with holes drilled in the bottom for drainage), and I tossed down hay to cover the dirt because I was tired of the constant dirt and mud in the house. He has his own garden (just dirt with a few random plants from seed) and a giant dirt hole that he loves to get messy in. That plastic structure is not pleasing to the eye, but it gets used a lot. Sheena: This was for my son’s 1st birthday. All the kids loved the tent which was an old one without a cover so nice and light. And using a bit of old carpet (we put down to stop weeds growing for grand plans pre baby!) but it now has another use! 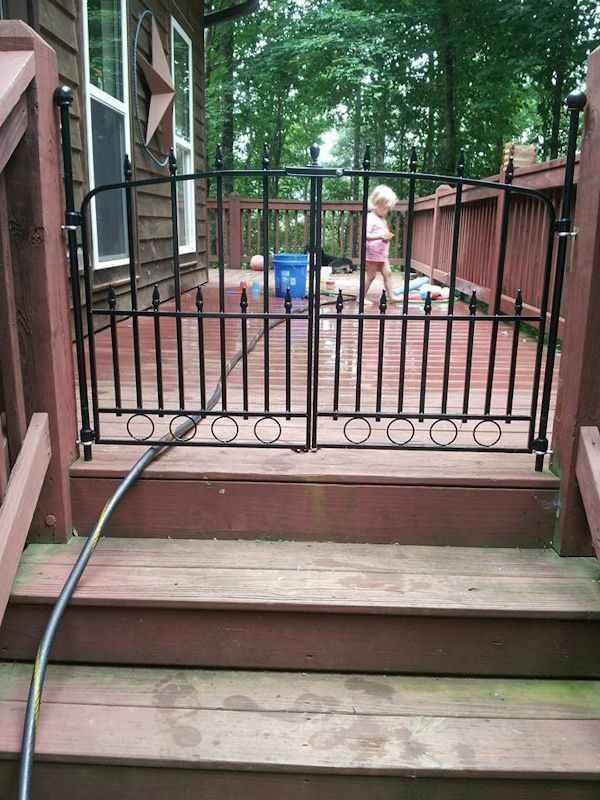 Sara: Our outdoor spaces aren’t particularly enticing, but a few things I appreciate are our gated deck, which we use for sidewalk chalk, paint, water play, soccer, etc. 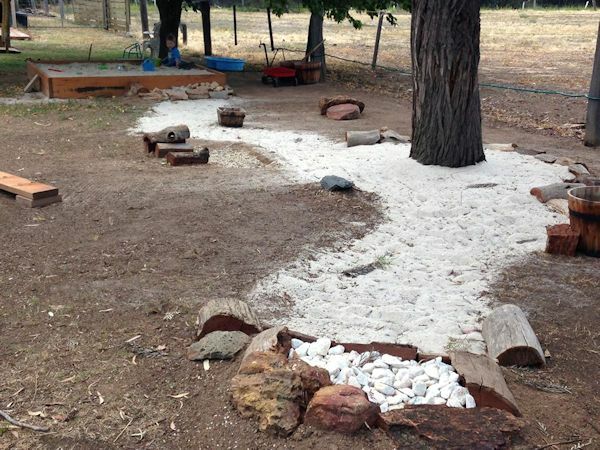 I also dig our “mud kitchen,” which is really just some rock structures (bench, fire ring, table) and random items from around the yard. 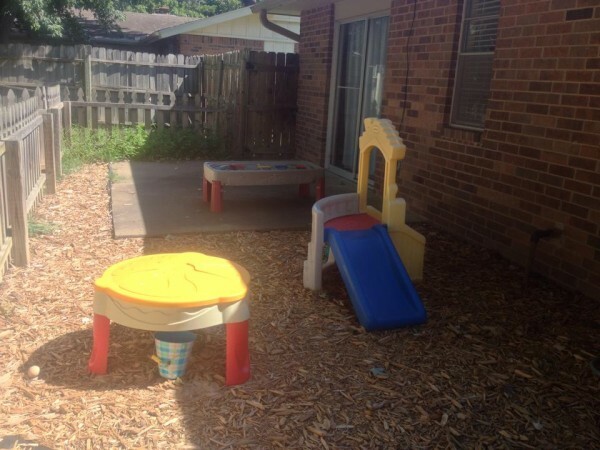 Brettania: We have very limited time and money to develop our outdoor play space, and we are renting so we can’t make many changes to our yard. 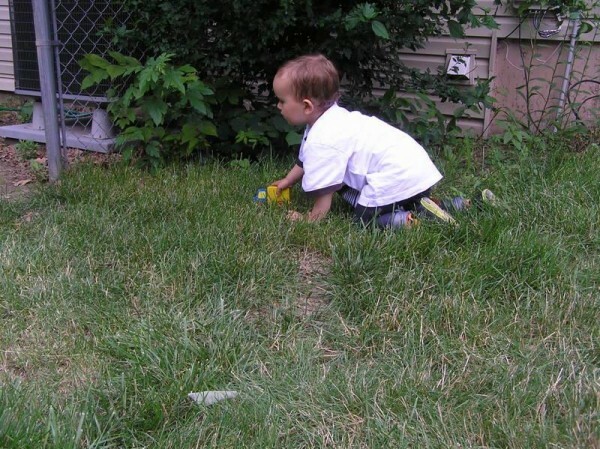 We are driven out of our backyard by mosquitoes for a lot of the summer, so we spend more time in our front yard then. I have found that lately my son loves the open-ended loose parts the most (cardboard boxes, random but safe items from our garage such as his sled). Sometimes these items look rather like junk (each morning after he plays I have to store all the cardboard boxes back in our garage), but they lead to the most imaginative free play. For example, it is amazing to hear my son explain in such detail what is in each cardboard box and who sent it, as he “delivers” the boxes to me each morning while pretending to be a delivery truck driver. 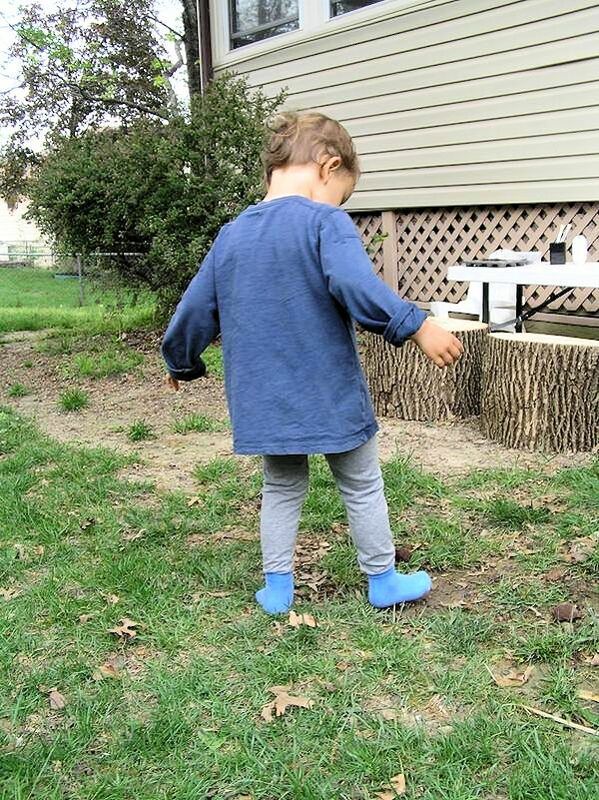 Where I am stumped is interesting outdoor play spaces for the baby (9 months), but I am working on developing something more for him than just his pack and play. 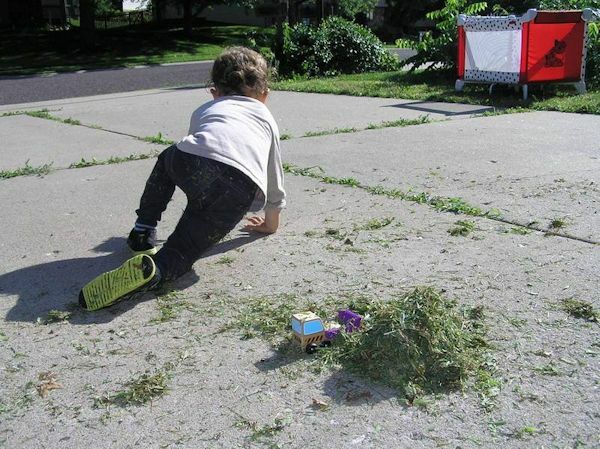 Grass clippings and toy vehicles to drive in the driveway. 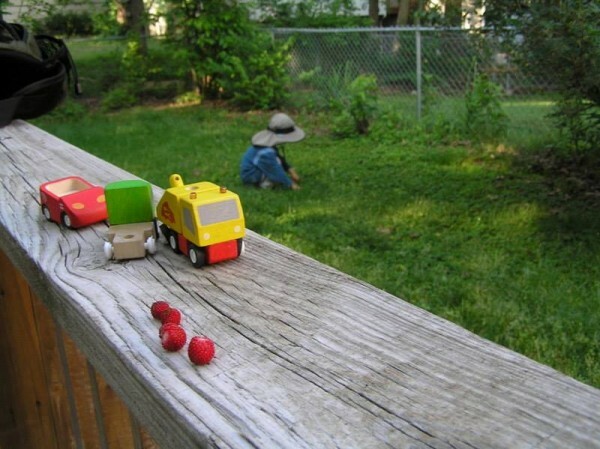 My older son likes to cover the vehicles with grass and transport grass in a toy dump truck. Pack and play for the baby. Cardboard boxes. 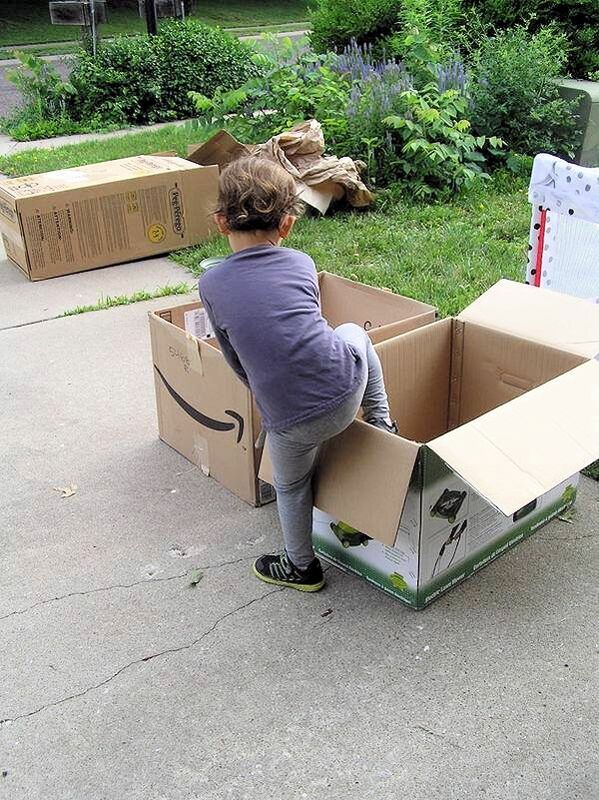 My son pretends he is a delivery truck driver and delivers a ton of boxes to me everyday in our front yard, and he also climbs into them. Random items. Here my son decided to use his sled by putting plastic balls into it and then spinning the balls around in the sled and dumping them back out. He also likes to roll the sled around in an upright position (like a disc). 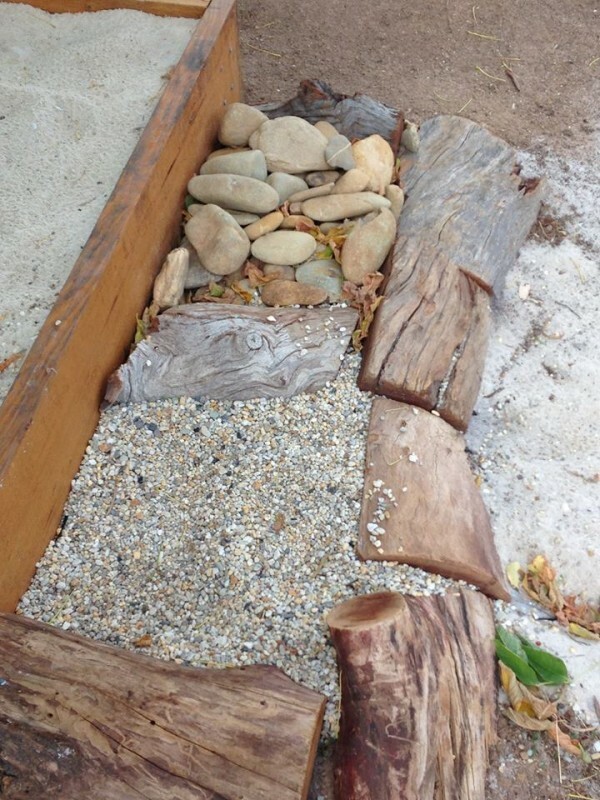 Rock box with pea gravel. We keep shells and plastic dinosaurs in it along with digging tools. Outside table for eating meals and for artwork. Tree stumps for chairs. 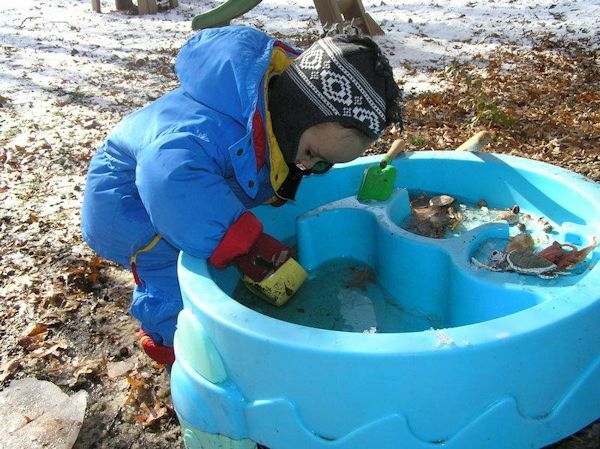 Water table that we use year-round. 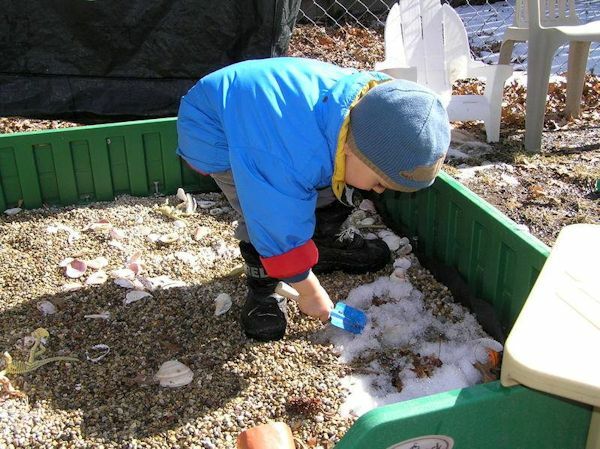 We keep plastic animals, shells, cups, and digging tools for the water table. In the background you can see our slide and the legs of our sand table. 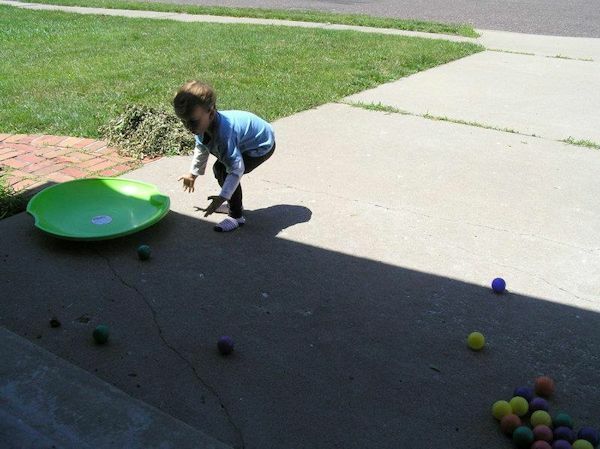 Bringing indoor toys outside sometimes (a toy truck) has been a big hit. 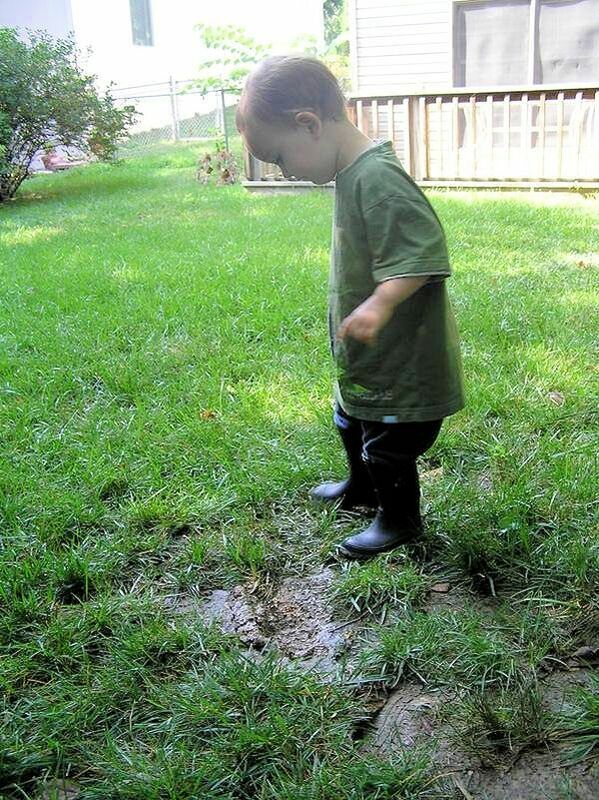 Mud puddles are so great for outside play that we sometimes make one with the water hose if it hasn’t rained enough. A HUGE thank you to all the parents (and children) for sharing your inspiring examples and suggestions! 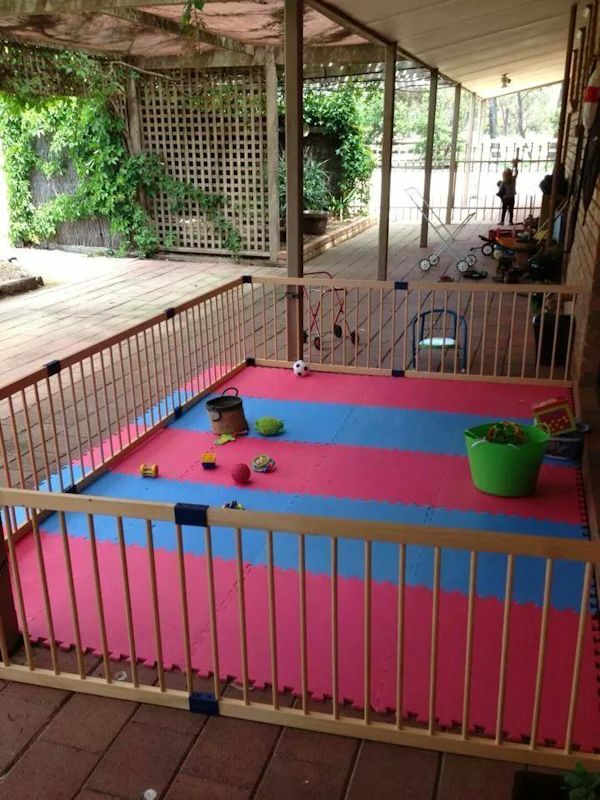 Where can you get the wooden play pen corral you have? Hi Rebekah! I’m sorry to say that I don’t know. It might not be available anymore. I really love this, but I can’t help but look at these pics and panic about spiders! 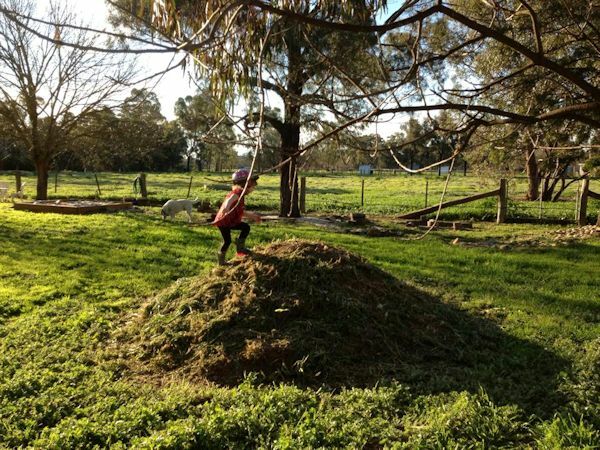 In australia those wood piles, dirt, blocks etc would be a quick host to redbacks and white tails :/ how do you guys deal with that and still have an area for exploring? I know! Red backs is all I can think of! My parents always had baskets of rocks and sticks etc for us to play with inside the house- we had a ‘rock building corner’ near a window, with baskets of rocks, shells, pieces of wood, plastic toy animals etc. never got any rednecks in them! So I guess that is an option? Otherwise if you kept rocks lined up (eg on a plank of wood) then there wouldn’t be the ‘gaps’ between them like there is in a pile, meaning rednecks would be unlikely to make a home. I want to make my outdoor area better for the kids but where I live has a lot of spiders and black widows. Every little crack and crevices becomes potential threat. I am working on making this better. Any suggestions how to make a safer outdoor area?? Other then checking for spiders regularly. I already do that! Spiders hate peppermint so you can make a spray of peppermint essential oil and alcohol and spray it around where you have problems with spiders and they will move elsewhere. The part I struggle with here is our climate – for a large portion of the year (ha, maybe 45 weeks out of 52), it is showery, could rain or has recently rained. It doesn’t mean that it is always raining but trying to set up outdoor playpens or having nice stuff like cushions outside isn’t enormously practical. We do have some nice outdoor stuff – balls, hoops, cones, stepping stones with big baskets to clear them up quickly, as well as sand etc. 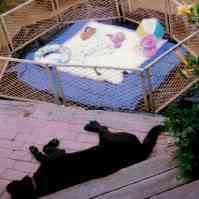 but I guess what I’d really like is to find a way to make an outdoor area safe so it is more relaxing being outdoors. I haven’t yet figured out a way to do that cheaply! 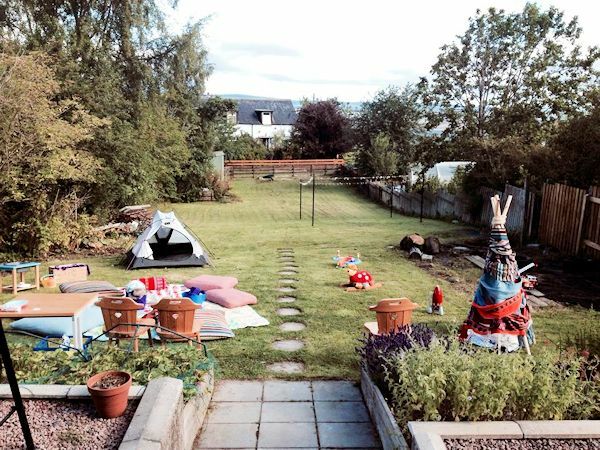 Thank you Janet for a lovely blog post with so many examples of outdoor spaces for very young children. In response to Juliette, if you are reading this, I understand. I live in Scotland and the climate is wet. 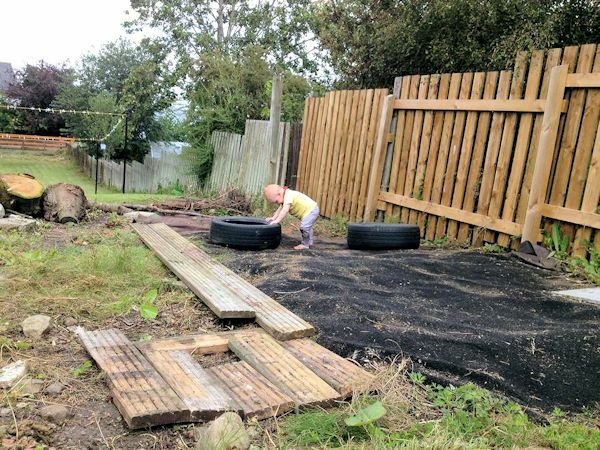 I have a whole section on my website about outdoor play spaces – whilst some modifications for the youngest children are needed, there should be plenty of photos for ideas and inspiration. Thanks for your website! 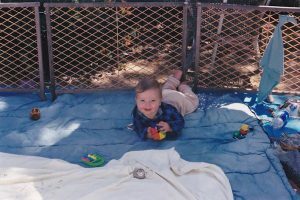 I have a question: I love the idea of having more outdoor time – my husband and I are very outdoorsy people, and want very dearly to pass this on to our son. My question is, how do you create safe, outdoor opportunities for pre-walking infants during the cold, snowy months? Here in the northeast, snow covers the ground November to March, and temps are often inhospitable from October to May, unless you’re moving around quite a bit or are bundled in so many layers you can’t move. It was lovely in the spring, summer, and early fall to stretch out in the grass with my son, but now the ground is frozen, and we’re facing down our first nor’easter in 48 hours. What outdoor opportunities do you suggest to help us survive the long winters and stave off cabin fever? I’m with Jess these spaces look great but we have to check every item every day for spiders. I’d welcome any tips on how people keep their outdoor stuff spider free? 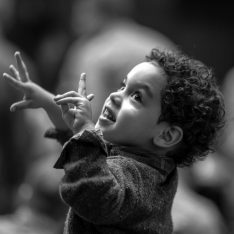 Children learn until the teaching starts. 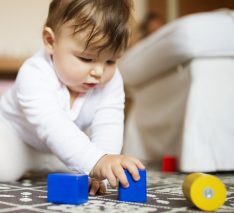 Open space to explore is the best ‘instruction’ we can provide, if we’ll sit back and watch (and coo!). Thanks for these ideas. Love the simplicity. I always feel bad not being able to afford all the fancy things i see online. These i can do. I really like these. Thank you. These all look so beautiful! 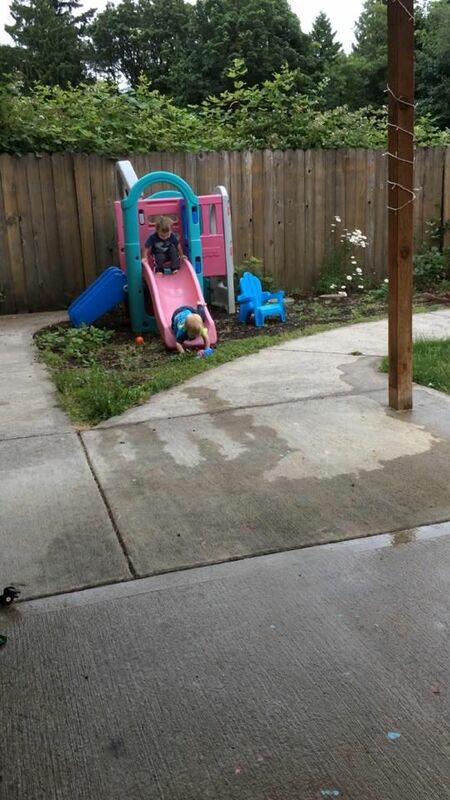 As an apartment dweller I’m saddened that my kid is missing out on such great outdoor play spaces since I don’t have a house with a nice yard. I wonder if anyone has any ideas for someone who’s renting an apartment with no playground. I have a small grassy area with a rickety wood picnic table, somewhat shaded by trees, within walking distance. I suppose I can try bringing out the pack n play and setting up there. We rent an apartment in the city as well, without so much as a hanging plant outside. Plenty of opportunity to play in the park or to get outside. If your playground or park doesn’t quite fit the bill, all the more reason to get together with others and improve it! Where do you guys live that you have such bad spiders? I’m not ever moving there. I wonder if anyone has advice about making a space in bear and snake country? I have a HUGE, amazing backyard- which is home to many snakes (mostly black), and black bears. Apart from investing in high, strong fencing and a large dog, I’m afraid of my kids getting hurt. And I really can’t afford dog/bear proof fencing right now. I want my 14 month old daughter to play outside more, but we have a serious black widow problem in our yard/neighborhood (some have even found their way into the house!). Luckily she gets to play with her cousins at my sister’s house a couple times a week and usually has outdoor time there. 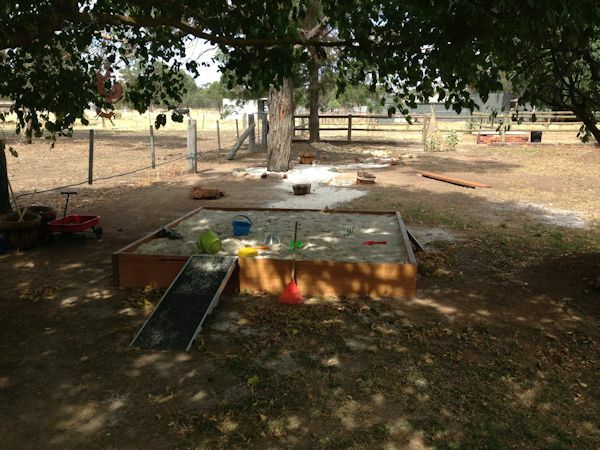 As soon as we set up a sandpit or sanded area it ends up covered in cat poo or ants nests!!! Just one night where we forget to cover over the sandpit and its got cat poo etc inside so I’m planning to get rid of it now. We live on a compound with heaps of cats and ants. 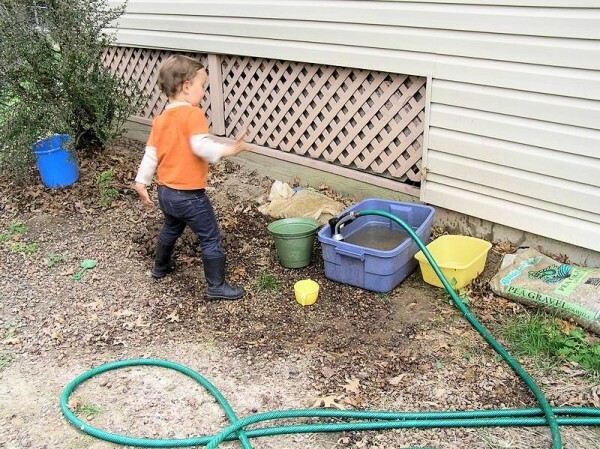 I have tried so hard to get a nice outdoor space going for the kids outside but even mud play ends up being mud/cat poo play which is just gross so not sure what to do. How do you keep cats/ants out of all these sanded areas?